Yellow is a color that represents blessings and the warding off of evil in Asian lore. It is most often used in this context in Nepal and India, where it is deemed important to protect your home and your person from any effects of unfriendly spirits. The image of the Buddha is typically represented by yellow in many Asian cultures. One of the brightest colors in the spectrum, yellow can easily add a decorative spark to any dull or mundane setting. Just seeing the color alone can provide an uplift in energy. 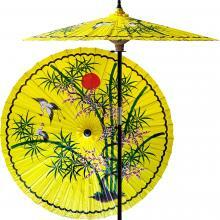 Check out our complete line of yellow Asian decor. Hang this charming Asian lantern in any room for inspirational Oriental decor. 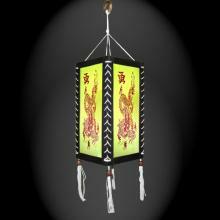 The art of using decorative lanterns to enhance one's home or office dates back over a thousand years to the Chinese. 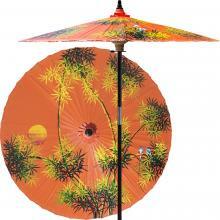 Beautiful and artistic, this outdoor patio umbrella features a juniper tree with two cranes flying near. Ideal for any outdoor setting, this stunning umbrella is perfect for adding a vibrant and colorful touch to any deck or patio. 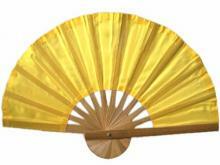 This sunny yellow bamboo hand fan will cheer up any room! Yellow is a very meaningful color in Asia. It is the most revered of all colors in Buddhism and represents humility and enlightenment. In Japan yellow symbolizes courage and valor. Clean, sophisticated and modern looking, our natural bamboo rug is perfect for enhancing any room while adding an Asian flair to any decorative setting. 2 x 3 foot returning to stock soon. This brilliant yellow hanging lantern will add a gorgeous decorative effect to any setting in your home. Enjoy this Asian lantern's warm yellow light for years to come. 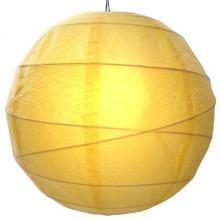 Use this radiant yellow hanging lantern to brighten up any drab decorative scene in home or office. Yellow is a special color in Asian lore and often used to represent the Buddha. 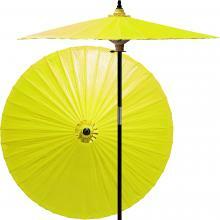 Add a burst of color and energy to your deck, pool or patio with this awesome yellow market umbrella. Painted and crafted entirely by hand, this captivating yellow patio umbrella will make a decorative impact in any area it is placed. 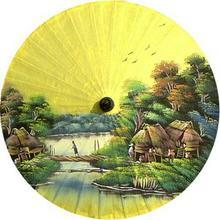 Yellow saa paper is painted with a quaint Thai village on this lovely sun umbrella. The bright shade reminds us of morning after light rains. 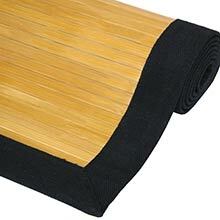 Bamboo holds an important place in Asian culture and art. It is not only practical, but beautiful to look at and is the feature of this exquisite hand-painted outdoor patio umbrella. This spectacular decorative scroll depicts Asian orchids in pink and green with a pair of fluttering butterflies. 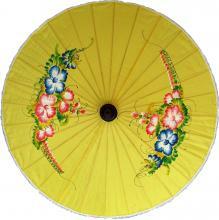 The yellow background is symbolic of geomantic blessings in Asian culture. A black Chinese dragon stands out boldly against a contrasting yellow background. A red Chinese dragon stands out boldly against a contrasting yellow background. 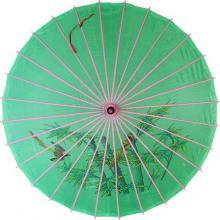 This light and airy sun umbrella is ideal for strolling around town with. It features two orange sparrows and green bamboo. Pink spokes highlight the shade, giving it a bright and bold look. 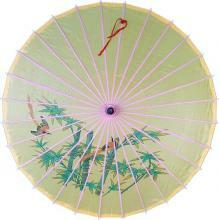 This beautiful fan depicts a cherry blossom design set against a yellow background. Yellow is a lucky color in Asian lore and is associated with blessings and the devine. Yellow is a very spiritual color in Asian culture and Buddhism. It is very closely associated with the color gold and the enlightened state. Yellow is also a vibrant color that gives off energy and good cheer. 16 inch returning to stock soon. A magnificent bamboo stalk with red-pink cherry blossoms at its side stands out against a yellow-gold background in this amazing Asian wall fan. This stunning work will bring any wall, room or spot in your home to life. Yellow is the color of joy, optimism, hope and laughter. 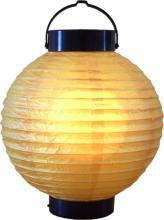 A yellow glowing Asian lantern is a magnificent spectacle and is perfect for brightening up any scene or mood.